It’s true. He really is a Parkour legend, so don’t mess with David Teten. Not that you’d have any reason to. A partner with ff Venture Capital, a New York-based venture firm which has made over 200 investments in over 70 companies across the US, Canada, UK, and Israel since 1999. He is also Founder and Chairman Emeritus of Harvard Business School Alumni Angels of Greater New York, the second-largest angel network in New York and cofounder of the Venture Capital Access Program, which helps women and minority entrepreneurs raise venture capital from members of the HBS Alumni Angels network. He is a Mentor with Founder Institute in New York and Singapore, Dreamit Ventures, Entrepreneurs Roundtable Accelerator, Lean Startup Machine, and Startup Leadership Program. And he still finds time to train in parkour (“Parkour is to entrepreneurs as golf is to (some) corporate executives”) and speak on panels at New York pitching events, where he always makes himself available to entrepreneurs. Awesome! Teten also co-authored The Virtual Handshake, which is available as a free download. 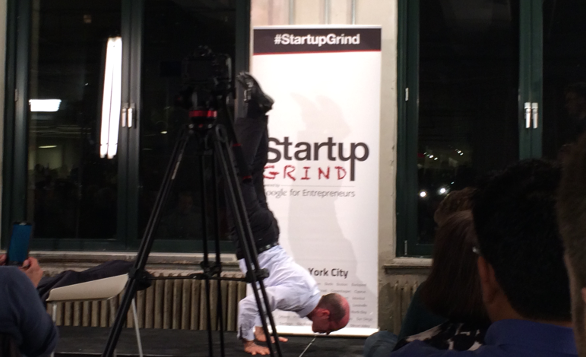 With a great degree of confidence, we can say that Teten is the only person in the New York Tech scene to have done on-stage vertical pushups, as we witnessed at a recent Startup Grind NYC event (see above). How awesome is that!